TGIF at GReads Week 5: TGIF is hosted by Ginger at GReads - be sure to check out her blog and join in the fun! This week's question: The Reviews We Don't Write: Have you ever read a book and not wanted to review it? Are some books too personal that we want to keep our thoughts our own? I’ve read a couple of books that I haven’t wanted to review, but not because my thoughts on them were too personal. My reasons were either that I really didn’t enjoy the book and I hate giving bad reviews, or the book was so complicated that I had absolutely no idea how to explain it or express my thoughts in a way that made sense. That being said, I can think of at least one book that I read before I became a book blogger that I wouldn’t have wanted to review because it hit me on such a personal level that I don’t know what I would have said other than how it affected me personally. Follow Friday Fun Week 9 - this weekly meme is hosted by Parajunkee and Alison Can Read. Check out their blogs for details/rules, and to join! Also, be sure to check out this week's featured bloggers on each of the girls' sites! This week's question: If you could write yourself a part in a book, what book would it be and what role would you play in that book? I’m sure that with Harry Potter being so popular, I’m not going to be the only one with this answer, but I really did give this question a lot of thought and this is my honest answer. If I could write myself a part in a book, it would be Harry Potter and I’d round out the trio of Harry, Ron and Hermione and make the group a quartet. I love these characters so much – their strength, bravery, and loyalty especially. Right from the beginning, I wished I had friends like the kids in these books. Besides their strength, bravery and loyalty, they're smart, funny, and just so real, despite the fact that they have magical abilities. I think it would be amazing to be part of a group like that and to stand and fight against evil and know that you have people who love you and would do anything in the world for you, including fight to the death. Plus, I'll be honest, I want to fly on a broomstick, play Quidditch, wield a wand, visit Hogsmeade, drink Butterbeer, ride a hippogriff, and go to Hogwarts! 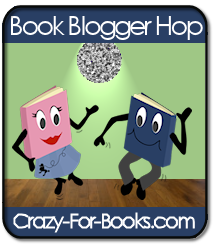 Book Blogger Hop Week 9 - This is a weekly meme hosted by Crazy For Books. Be sure to stop by her blog to check it out. This week's post is here. This week's question: What's the LONGEST book you've ever read? Unless it's something that I really want to read, I try to stay away from long books because I'm a really slow reader and long books just eat up too much time. I'm not sure about actual numbers, but some of the Harry Potter books were in the 600-700+ range, and I've read them multiple times. The Twilight Saga kept getting bigger with each installment, I think Breaking Dawn was 700+ pages. The Host by Stephenie Meyer was in the 600+ range. A lot of Nora Roberts books are 500-700+ pages. A Discovery of Witches by Deborah Harkness was 600+. The Name of the Wind by Patrick Rothfuss was 700+. I'm not sure which was the longest, but I can guarantee you that with the exception of HP, these all took me forever to read! hello c/o TGIf. nicely put. have a wonderful weekend. Hahaha- I love the picture! New follower! Nice picture! As much as I love Harry, I think if I could I would join Voldemort's side just because I could. I'm such a "goodie-to-shoes" that it would be fun to be bad for a day. p.s. check out my first giveaway! And a nice picture. LOL. It seems like HP is the most popular pick this week but Breaking Dawn is a close second. HP is a popular answer today:) Have a great weekend! I agree with your TGIF question. :) And I love the Harry Potter picture. haha! Harry Potter has been popular with this question! Thanks for stopping by the blog. I'm a new follower as well. ;) Have a great weekend. Love the picture, happy Friday! New Follower! Return the favour? Joining Harry is a great answer! Love those books. Harry Potter! I love how (belatedly) I am rediscovering how much this series means to me. I'd be right there with you! Hi, there!! New follower here! I love your answers for both questions, but especially the first one!! 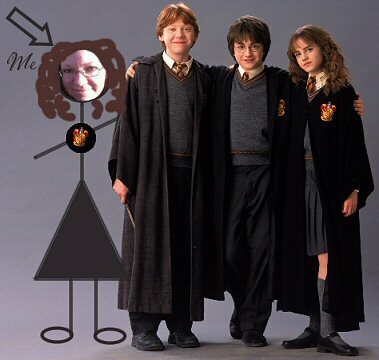 I'm a big Harry Potter fan, and I would SO love to be able to live in his world!!!! I would love to do all the things you've memtioned in your post, especially riding a hippogriff!!!!! Oh, bliss!!! Come on over and check out my Follow Friday post! Love the Harry Potter picture. Thanks for stopping by. I was actually thinking about the other question, longest book read... I'm not sure on that one myself, but since you said Breaking Dawn was 700+ pages, I'd probably have to go with that one! I love the picture! I can't quite remember if any of the Harry Potter books I chose were longer than breaking dawn. I read breaking dawn in 1 day so I didn't count it. Stop by my blog this weekend if you like....book giveaways and 99 Cent E-books.